Dunlop, specialist manufacturer of tiling, decorating and flooring products for the trade, have hired a new Area Sales Manager (ASM) for the Midlands. 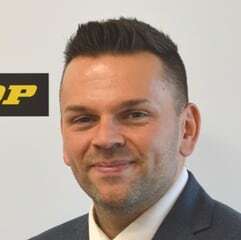 Wolverhampton-based Michael Maher joins the company’s outstanding sales team and will work with builders’ merchants, decorating supplies centres and tradesmen to help drive sales and increase awareness of the Dunlop and Dunlop Pro Décor brands across the industry. Michael has extensive field sales experience joining from independent boiler manufacturer Ravenheat where he managed relationships with local and national merchants including Travis Perkins, Grafton Group, Plumbase and Selco. He previously worked at a sales representative for MSC Industrial Supply Company. Debi Boulton, Sales and Marketing Manager at Dunlop, said: “We’re delighted to welcome Michael to our sales team who has a strong sales background working with large national and independent merchants across the Midlands, Wales and the South West. Micheal added: “I’m delighted to join such a well-respected and forward-thinking brand in the merchant and decorating sectors which is known for producing quality tiling, decorating and flooring products for the trade. All of Dunlop’s tiling products are supported by a 10-year guarantee and a dedicated technical helpline is operational in case any questions arise whilst on the job. What’s more, merchants and tradesmen are supported by a nationwide team of Product Support Technicians (PSTs) available on-site, in-branch, on-the-phone and online.